Lock in a great price for Monchique Resort & Spa - rated 8.7 by recent guests. The breakfast was excellent and the location very good. The staff were extremely helpful. Our microwave oven and television in the bedroom did not work, but they were replaced immediately. Overall a very good break and very nice hotel and surroundings. We also enjoyed the spa and the therapists were very kind and excellent at their work. Spa was lovely and children could use the pool in the mornings. Very nice views and rooms , we had a panoramic suite, very spacious and nicely decorated , little kitchen area too , robes and toiletries included.Spa small but nice.Excellent breakfast. Nice weekend break.Super value for money. The staff and service have both been exceptional, in particular Emma and Marthe in the fitness team. We’ve really enjoyed the classes. The staff, the activities, the spa, the location and the hotel itself. wonderful acommodations, nice view, delicious breakfast. Excellent size suite, two bathrooms good WiFi, location, staff. Breakfast was excellent with a good choice and an omelet cooked to order. The coffee was especially good. We asked if we could just have a swim in the indoor Spa pool as the outside pool was cold and they readily agreed, waiving the charge. Staff were always helpful. The rooms were large and comfortable. There is an excellent restaurant just over the road which is about half the price of the hotel restaurant for dinner. Free Garage parking. I liked the apt. style hotel room. Bartender was very nice and informative. Breakfast really good with a chef that cooks your omelet etc. Everything! But mostly the staff, everyone was very friendly and helpful. 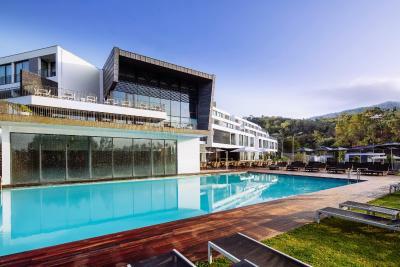 One of our top picks in Monchique.Surrounded by nature and views of the Algarve coast, Monchique Resort & Spa is situated in the Serra de Monchique and features restaurants, 2 outdoor pools and a variety of Spa experiences. The resort’s luxurious suites are elegant and beautifully appointed, offering a separate bedroom, large living room, two bathrooms and a balcony or terrace with outdoor furniture and some with stunning views over the mountains and coastline. Free of charge WiFi is available in all areas. Each of the restaurants at the Monchique Resort & Spa offers a unique gastronomic experience. From award-winning fine dining through Neapolitan pizzeria and tapas style restaurant right to the themed international and national buffet. In addition, there is an on-site market with wines, food, pastry, snacks and souvenirs. The Mezzanine cocktail bar often has live entertainment and the bars serve a variety of drinks and light snacks. The Sensorial Spa features sauna, steam room, aromatherapy, an indoor heated pool, relaxation rooms, 8 treatment rooms and much more. The 24-hour gym has a variety of high-end Technogym equipment. Personalised training sessions can be booked, for a surcharge. Children between 4 and 12 years old are welcome at the on-site Kids Club available every day. Guests may engage in activities like bird watching, jeep safaris, hiking, horseback riding, stand-up paddle and mountain biking. The hotel is a 60-minute drive from Faro International Airport. It is only a 20-minute drive away from several beaches in the Portimão area, and a 15-minute drive away from the nearest golf course. Monchique Resort & Spa has been welcoming Booking.com guests since 12 Mar 2010. When would you like to stay at Monchique Resort & Spa? This well-lit suite offers a contemporary design coupled with a range of high-end amenities. It features an elegant bedroom with a king-size bed that can be split into 2 single beds upon request, a furnished balcony, plus a separate living room with floor-to-ceiling windows. The use of the kitchenette equipment is available on request at an extra charge. This spacious family suite offers a contemporary design coupled with a range of high-end amenities and can comfortably accommodate 2 adults and 1 child (0-2 years old). It features an elegant bedroom with a king-size bed that can be split into 2 single beds upon request, and a separate living room with a sofa bed and access to a furnished balcony. This spacious family suite offers a contemporary design coupled with a range of high-end amenities and can comfortably accommodate 2 adults and 2 children (0-12 years old). It features an elegant bedroom with a king-size bed that can be split into 2 single beds upon request, and a separate living room with a sofa bed and access to a private furnished balcony. The use of the kitchenette equipment is included in the rate. House rules Monchique Resort & Spa takes special requests - add in the next step! Monchique Resort &amp; Spa accepts these cards and reserves the right to temporarily hold an amount prior to arrival. Monchique Resort & Spa accepts these cards and reserves the right to temporarily hold an amount prior to arrival. Please note, for safety reasons, access to the Gym and Spa areas is only available to guests over 16 years of age. Guest access to the Spa area is not included in the rates, unless otherwise specified in the room description. Please note that the credit/debit card used to book the Standard Rates is required for confirmation purposes only, no charge is made in advance. For Non Refundable rates, full payment for the stay will be taken by the resort any time after the booking is made. These charges are non-refundable and non-transferable. Breakfast is included for children in Family Suites only. Children's dinners are not included and should be paid directly at the property. Please note that opening periods of restaurants and bars depend on occupancy levels, for updated opening times of the restaurants, guests should enquire the Monchique Resort & Spa. Please note that the Monchique Resort & Spa provides a variety of leisure programmes with activities related with Fitness, Family and Nature. Please contact the Leisure Team near the reception for additional information. These programmes are only available upon request and are not included in the rate. All children under 12 years old stay free of charge when using existing sofa beds in Family Suites. Please inform Monchique Resort & Spa in advance of your expected arrival time. You can use the Special Requests box when booking, or contact the property directly with the contact details provided in your confirmation. Noisy A/C Matress not so comfy. Bad shower. Was a very good experience. All perfect. Breakfast - Top class. Hotel facilities - Top class. A lot of offers to keep us occupied if we want. I had a poor experience at the restaurant, with mis-timed serving of dishes. Also too expensive. The regular restaurant just up the road is fine and half the price. I got a great deal on a beautiful suite. The buffet breakfast was outstanding. Staff were friendly and helpful. A good location up in the hills, handy for hiking and trips to the coast. Love it! But we want to bring our dog next! The restaurant menu has no variety and the few dishes they have come differently from the kitchen. They should be constant with the same ingredients as per the menu description. I complained twice, but the responses sounded like the person in the kitchen didn’t care. The window in my bedroom was very shaky with the winds, it seemed to be broken or doesn’t close properly. The cleaners missed the bath a couple of days. The room was dirty (we found cigarettes and a lighter under the bed). You have to pay an extra (25€/day) to use the spa area and it only allows you to stay for 2 hours, which is a big con if you’re staying more than one day. The structure of the building can be confusing and it depends a lot on a few elevators. Charging to swim in a spa hotel seems unnecessary. Great location, amazingly tasty breakfast, free parking, recycling bins for paper, glass and plastic, kitchen. Great place in a beautiful spot. Amazing views topped with superb facilities and the highest standard of customer service. Perfect for a break from the city and a get away weekend. No bedtime chocolate 2nd night!